/ Blog / Windows / Window Condensation: Should You Be Worried? Window condensation is generally regarded as a problem. But you might be surprised to know that it actually isn’t and in most cases, addressing it won’t cost you anything. Your expert window installer Woodbridge Home Exteriors shares an in-depth look at what causes window condensation and how it can be addressed. When the moisture in the air gets in contact with a cool surface, it collects and forms condensation. The moisture that collects on a glass of cold water isn’t coming from the glass itself. Rather, it’s the moisture in the air collecting on the cold outer surface of the glass. 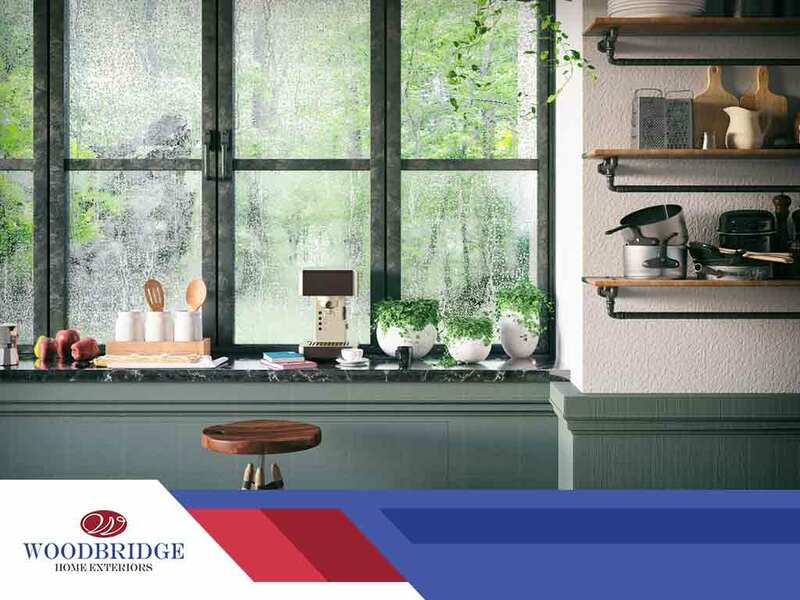 In terms of windows, it is important to know which side of the window the condensation is forming, as it can indicate whether the condensation is a problem or not. If the condensation is forming on the interior surface of the window glass, it can mean your home has unusually high humidity, which could indicate an air conditioning or venting problem. However, if this is happening during cold months, it indicates that your window insulation isn’t as effective. Heat loss can also happen at this point. The reverse can also happen during hot and humid days, if the windows feel cool to the touch at the exterior surface. You may need to consider replacement windows with a lower U-Factor if this persists. Condensation forming between the glass panels is a less common occurrence. If the seal between the sash and glass panels are broken, moisture may get in between and collect at the cooler side. If the window package is filled with an insulating gas, the panels will gradually press together. For indoor humidity, you will simply need to control the source of moisture. Regularly vent out the bathrooms and kitchen by opening the windows for at least 15 minutes a day. Check the air conditioner settings and make sure it’s not “short cycling” or turning off and on too fast. If the latter type of condensation persists, call a replacement window expert and have them check if the windows can be repaired or if it’s up for replacement. To learn more about our vinyl replacement windows, call Woodbridge Home Exteriors today at (972) 217-7585 (Texas), (405) 252-1548 (Oklahoma), or (316) 226-8011 (Kansas). You can also fill out our contact form to schedule an appointment. We serve many areas in and near Lubbock, TX.